Every Hip-Hop head has a turning point. It’s that point where you evolve as a music fan, and start to break things down for yourself. Music is no longer just music – it’s something you deconstruct, and in the process, you learn to expand your own horizons and welcome new, often more experimental sounds. I distinctly remember my turning point at Turntable Lab’s former Fairfax location, when I naively asked the employee to recommend me anything that sounded like my favorite independent Hip-Hop record label, Stones Throw. The employee was completely confused, and told me he didn’t know quite how to answer that. Well, I now understand why. It’s challenging, and oftentimes, unfair, to classify an entire record label as being representative of one specific sound, and Stones Throw Records is the ultimate example of this. 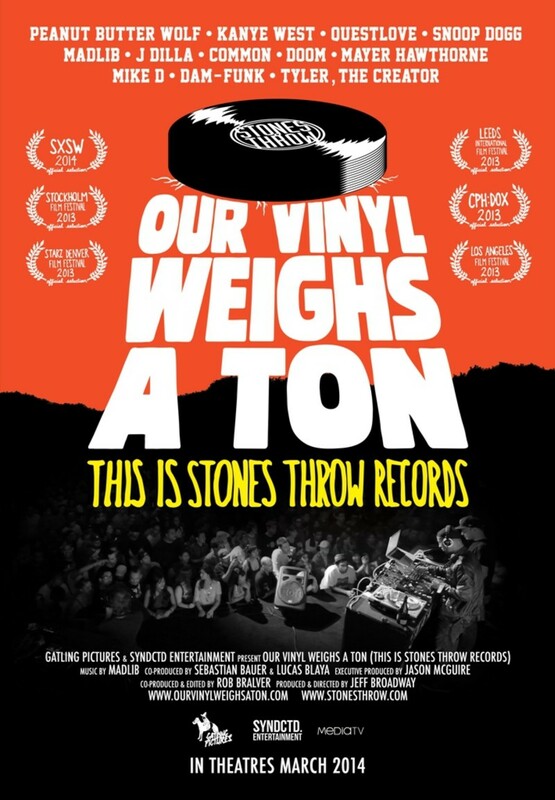 Jeff Broadway’s latest documentary, Our Vinyl Weighs a Ton: This is Stones Throw Records, documents this struggle and highlights the label’s journey and ever-evolving roster of avant-garde artists. Last Monday, the documentary premiered in Los Angeles at the Arclight Theatre, among a large crowd of music lovers, Hip-Hop heads, and loyal fans of the label. In a not-quite-linear fashion, Broadway traces Stones Throw’s initial development, starting with Wolf’s early obsession with music (saving lunch money to buy records and splitting the collection with childhood friend, Baron Zen), and goes on to describe his friendship with the late Charizma, and the group’s budding success on the Hip-Hop division of Disney’s former Hollywood Basics record label. Charizma’s passing caused Wolf to take a hiatus from music, but in 1996, he returned to found Stones Throw. Ever since then, he’s released some of underground Hip-Hop’s most beloved cult classics, like Madvillainy, The Unseen, and Donuts. But don’t get it twisted. Stones Throw was never meant to be one-dimensional, and Wolf makes that point clear in the documentary. In fact, over the past few years, Stones Throw Records has acted somewhat as independent Hip-Hop’s gateway drug. Peanut Butter Wolf has developed a reputation for signing artists he likes, rather than what sells, and in the process, he has brought unique sounds to many a Hip-Hop head’s record player. It’s clear that Wolf has a discerning ear for music, and the film of course, details the come-up of more prominent artists like Madlib (a vital piece to the Stones Throw story), Mayer Hawthorne, and Aloe Blacc (who declined to be interviewed for the documentary). But aside from that, an equally interesting component of this documentary is the focus on Wolf’s struggle to avoid critics pigeonholing Stones Throw as a “Hip-Hop” label. Some of Stones Throw’s more enigmatic crew members, like James Pants, Gary Wilson, and Anika, get some spotlight, and whether you enjoy these releases or not, Wolf’s dedication to endorsing artists that he likes, with disregard to money and fame, is something to be applauded. Overall, Jeff Broadway did a solid job documenting Stones Throw’s history from its inception to its current state, even including more recent footage, like that of Snoop Dogg and Dam-Funk’s “7 Days of Funk” collabo. Behind-the-scenes footage from concerts and venues like Boiler Room also add an intimate quality for long-time fans. In terms of editing, animated sequences and the artwork of Jeff Jank are spliced throughout the film, creating a style that can only be described as uniquely “Stones Throw,” and the original Madlib score will make you want to bust out your entire Beat Konducta collection. Interviews with industry heavy hitters like Common and Kanye West offer an interesting additional layer of insight. Our Vinyl Weighs a Ton is currently on a world tour, so catch it while you can, and while you’re at it, cop the DVD in April and school yourself on one of independent music’s most important record labels.